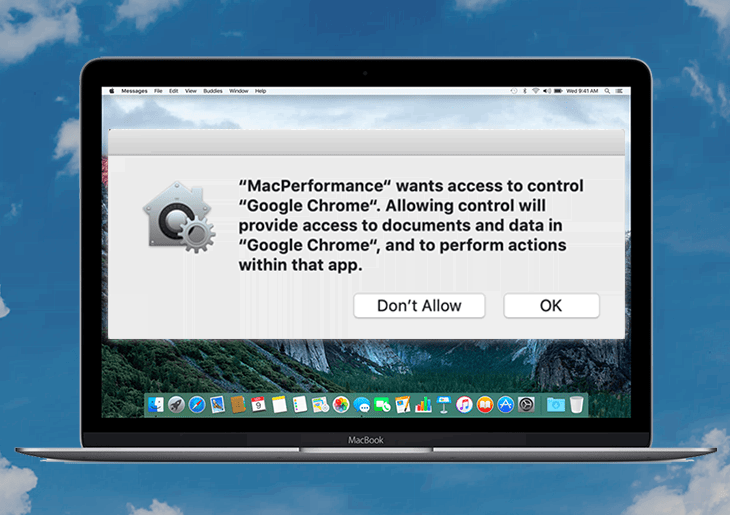 Learn how to treat the “MacPerformance wants access …” popup alerts, what their origin is, and how to prevent these dialogs from being displayed on Mac. Given Apple’s well-orchestrated control over the software that can reach Mac desktop computers and laptops, cybercriminals are bound to look for intricate workarounds to lay their hands on Macs. One of these techniques that splashed onto the scene just recently involves several layers of attack. First, the malefactors employ app bundling to deposit common adware onto the host. This potentially unwanted program isn’t particularly harmful and cannot obtain any significant permissions on the infected Mac, with its impact being restricted to triggering popup alerts that say, “MacPerformance wants access to control Safari / Google Chrome”. Now, these dialogs are the ones that attempt to expand the attack surface beyond the annoyance effect only. At this point, the right question to ask is: what is MacPerformance? It sounds both trustworthy and fishy at the same time. Once you dig a bit deeper in the affected macOS, it turns out to be an application that sits under the Library path in home folder. The subdirectories where its components can be found include LaunchAgents and UpdateMac, and Preferences. With the name being kind of appealing, the behavior of this item raises a few red flags and is a giveaway. Regular applications don’t need and won’t ask for the scope of privileges that MacPerformance is after. Here are the details on the requested access expressed in the noxious popups: “Allowing control will provide access to documents and data in Google Chrome / Safari, and to perform actions within that app.” Note the editorial slash in the above citations – the MacPerformance malware can poison either web browser. Furthermore, it’s most likely to support Firefox, too. Ultimately, the malicious code tries to get its privileges escalated to the extent where it can spy on and literally steal all of the victim’s web browsing data, including visited sites, bookmarked pages, as well as authentication information (usernames and passwords). With such an unrestricted access at their disposal, the crooks behind the MacPerformance virus can pull off identify theft, compromise one’s online banking account, and conduct phishing campaigns. One of the interesting things about these irritating popups is that although they contain the “Don’t Allow” and “OK” buttons, selecting the former won’t stop the adverse activity in its tracks. The alerts will continue to appear regardless. In order to get them out of your sight, you need to get rid of the MacPerformance virus. The problem might be that its fragments are dispersed across macOS, and it may be quite challenging to find them all. The walkthrough below can help thoroughly locate the traces of this culprit and eradicate them to fix the issue. When confronted with malicious code like the MacPerformance virus on Mac, you can neutralize its toxic impact by leveraging a specially crafted system utility. The Freshmac application (read review) is a perfect match for this purpose as it delivers essential security features along with must-have modules for Mac optimization. This tool cleans unneeded applications and persistent malware in one click. It also protects your privacy by eliminating tracking cookies, frees up disk space, and manages startup apps to decrease boot time. On top of that, it boasts 24/7 tech support. The following steps will walk you through automatic removal of the MacPerformance infection from Mac. 4. Check whether the “MacPerformance wants access …” popups problem has been fixed. If it perseveres, go to the Uninstaller option on Freshmac GUI. Locate an entry that appears suspicious, select it and click Fix Safely button to force-uninstall the unwanted application. 5. Go to Temp and Startup Apps panes on the interface and have all redundant or suspicious items eliminated as well. The MacPerformance malware shouldn’t be causing any further trouble.